A business dinner is a form of a business event that’s definitely underrated. Think about the power of a date, and how excited people get to go on one of them. Now, think about how excited your clients or customers would get if they were to be invited to a business dinner. We mean hello, there’s a dinner involved, and where food is involved so is happiness! But you often don’t find that people host business dinners. There are some companies out there who do it, and we promise you they’re doing things right. It’s a way of enticing new customers, keeping old customers, and asserting a force of power over the business world. For a business to host a dinner, it is seen to be in the money, especially if it’s a fancy dinner. But if you’ve never thought about hosting one before, and you just don’t have a clue what to do or why you should do it, then keep on reading this article! Ok, so if you don’t know how beneficial a business dinner is going to be, then let us enlighten you. A business dinner can easily bring in new customers for one. If you know you’re working on a contract or a deal with a big customer, then the one thing that can really draw them in is your hospitality. 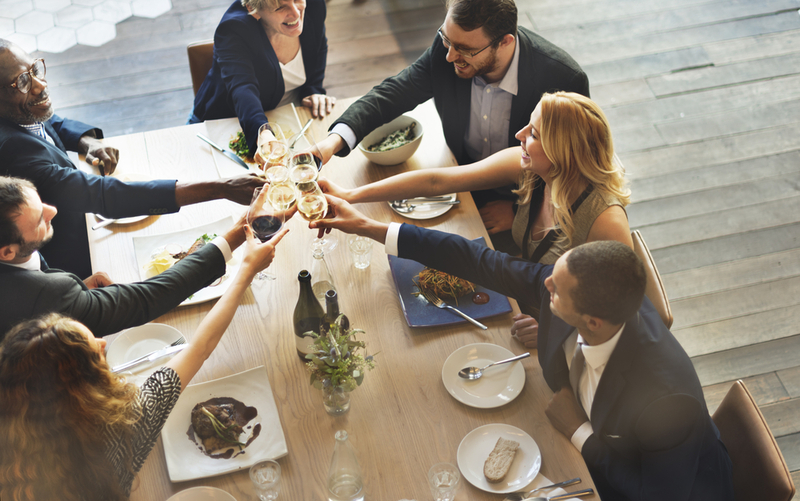 Because hosting a business dinner is not all about a show of power, it’s about building a connection with the customer you want to work with on a level that isn’t just business. They also don’t have to be as expensive as you think, which is what we’ll move onto in a minute. It’s also good for your exposure. Word will spread about your company and the length it goes to please potential and existing customers, and it’ll draw people in that you don’t have to impress with a business dinner. Ok, so there’s two options here, and we like the thing that we’re going to talk about first, the most. Hosting a dinner at your home is a more personal and fancy way of doing it. You’re not only inviting the customer into your business, but your home as well, so it builds more trust than you would imagine. If your business is pretty big and you’ve managed to afford a fancy home, then it really does set the scene. You could get yourself a domestic worker to serve the food, and it could all be pretty formal, whilst still being informal. Domestic worker training is easy to do as well, companies will do it for you! Or, if you don’t like the home idea, you could always book a table at the nicest restaurant in town. You have to go fancier, it’ll give a much better impression. To make sure it goes without any hitches, you need to make sure you’re focusing on keeping the dinner casual. Don’t just talk about the formalities of business, talk about your personal lives and get to know the person. The more you just focus on business, the more boring it will become.